First day of working on winter trails. The long midsummer hikes are over. There will be no more high country trail work this year. Feeling my brain clunk as it shifts to ski trail maintenance. There is a whole other set of parameters to consider. While there is no snow on the ground now, I visualize how it will fall and lie over logs and brush. How it will catch in the branches of the trees, creating tree wells. Skiers and snowshoers will be up off the ground on the snow. What will impede their safe travel? What will cause an uneven icy snowpack, and can I do anything to make a better travel corridor? We worked near the Swauk Campground on Highway 97. 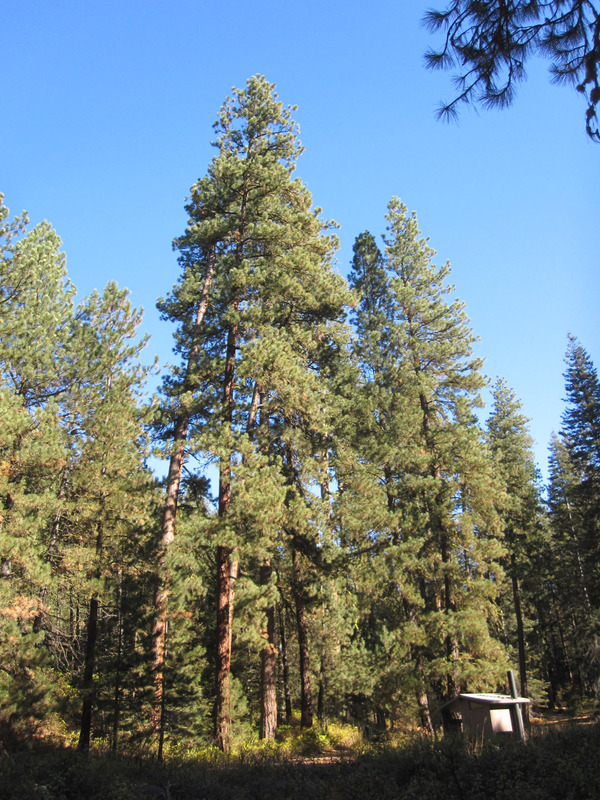 The Swauk drainage is home to some magnificent ponderosa pines. Old ponderosa pine stands in Washington are rarer than coastal ancient forest. They grow in the lowlands and were easily accessible to earlier generations looking for mine timbers and wood to make apple boxes. Most of the big trees are long gone. The stands that remain have filled in with a shade-tolerant grand fir understory. This is a result of putting out every forest fire for the last hundred years. Ponderosa pines evolved with frequent low-intensity fires, which kept the undergrowth to a minumum. The campground was built in the 1930s, and has a wonderful example of CCC workmanship in its stone and timber picnic shelter. Within a few hundred feet of the trees and historic structure is a nearly constant stream of traffic whizzing to and from Blewett Pass. At least half the vehicles are large trucks grinding up the grade or whooshing down with all eighteen wheels thundering on the pavement. We worked the morning in the shade where the ground was frozen. At lunchtime we hiked back to a large patch of sunny ground near the picnic shelter. It was noon and the sun was hanging in the south over the ridge. Shouldn’t it be high overhead? I ate beef-n-barley soup from the thermos with a piece of sourdough rye bread, then settled back on my pack to be a solar collector. This is as bright and warm as it would be all day. Savor it. A squirrel was pitching a fit in a nearby pine, and we saw why when a raptor sailed through the canopy. 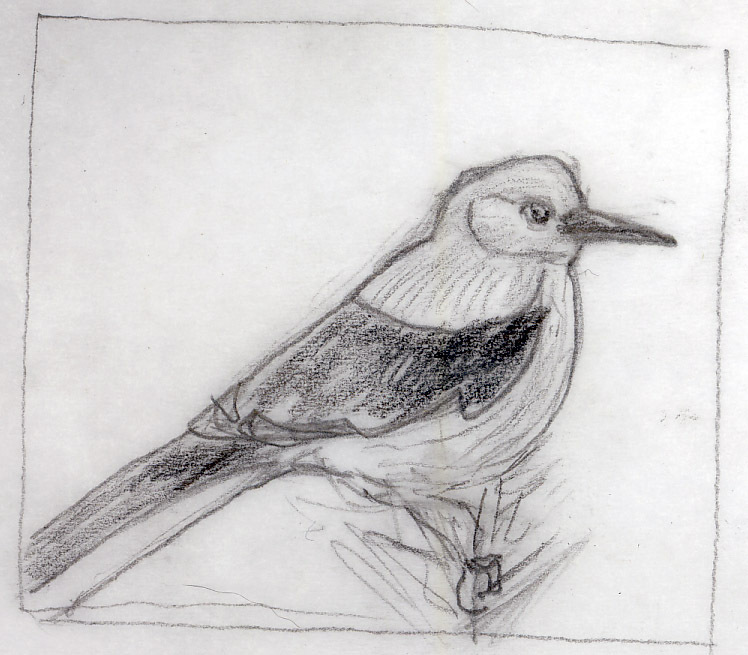 I sat up to scan the pines, and saw Clark’s nutcrackers. Pretty sure I had heard them earlier. There were at least six birds, moving from pine to pine. Clark’s nutcrackers are some of the most interesting characters in the bird world (in my humble opinion). Related to crows and jays, they are intelligent, gregarious, and somewhat raucous. Handsome gray plumage is set off by black wings and tail with white edges. They look sharp and crisp. Their preferred food is whitebark pine seeds, which they collect and cache. The whitebark pine lives near timberline and has been hit hard by whitepine blister rust, a fungal disease introduced from Europe in the early 1900s. Climate change is predicted to push hard on specialized plants and animals, so those with small niches and tough habitats face an uncertain future. I watched the nutcrackers foraging in the ponderosa pines and wonder if it has been a lean year for whitebark pine seeds. Would that explain them being down from timberline? “Well…” I said and got up. Time to go back to work. Back to the shade under the trees and frozen ground. I ran the saw all afternoon, in that zone where I feel the machine vibrating my hands and I’m aware of where I put my feet and the tip of the bar. Even now as I write, I smell the grand fir sap on my clothes warmed by my body heat. Walking back to the truck at the end of the day as the sun slipped west. The air was cooler, the shadows deeper. I heard trucks and nutcrackers and the squirrel was still hollering about something. This is November. Snow will come any day. Debra, I was recently directed to WordPress and your blog… was charmed and… well, here I am. I do like this blog and ALL your blogs.